The final polish I had swatched was also from the Maleficent Duo called Mistress Of All Evil. 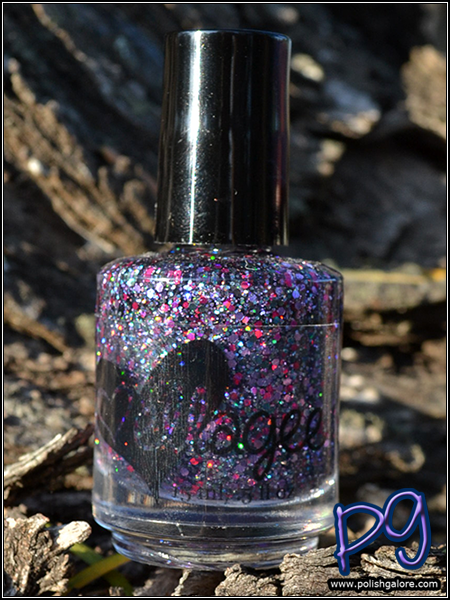 This is a clear glitter with a mix of black, purple and hot pink holo glitter. I used 2 coats of dabbled polish over Now Shall You Deal With ME! You can see how there is a good mix of the colors in the pink and purple glitters. The black seems a little out of place but it still works. Especially in the shade, the glitters stick out individually. I was a little surprised at the coverage in 2 coats but you can always use the dab technique where you dab the glitter onto a makeup sponge to absorb the clear base and then dab the sponge onto your nail. Oh, I like this glitter topper a lot! That is one stunning glitter shade, and it would work well with a huge variety of colors! I don't think I've ever seen a glitter topper over a holo, and I love it! I'm loving the name and the pretty glitter, but I ADORE Now Shall You Deal With ME - what a gorg holo! I really like this glitter! I like that glitter topper - it's such a fun pairing with the green shade. Fun. I love the black in the mix- the holo really pops! What a fun glitter! And you combined it in such an original way - I like! This is a pretty topper!